The US Embassy in New Delhi, together with Meridian International Center and Harvard University’s Pluralism project, began a unique photo exhibition on Indian religious traditions in the United States at the American Center on Thursday. The exhibition titled Keeping Faith: Indian Religious Traditions in the United States, which will run from May 18 to 31, is showcasing how Indian Americans practice their faith and traditions in the United States. It also brings to the fore how Americans have adopted the Indian faith and traditions. 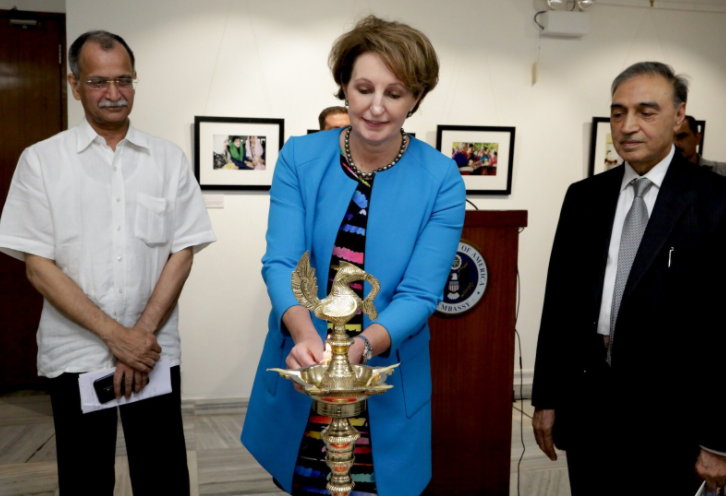 US Embassy Chargé d’Affaires MaryKay Loss Carlson inaugurated the exhibition by lighting the lamp along with Indian Council of Cultural Relations (ICCR) Director Amarendra Khatua and President of India Islamic Cultural Center Sirajuddin Qureshi. The collection of photographs in the exhibition highlights how Indian faiths have flourished across the US. They illustrate how individuals, communities and organizations practice their traditions and celebrate their differences. “From Massachusetts to Hawaii; from California to Florida, the contribution of Indian Americans to the American experience through religion highlights not only India’s deep influence in US society, but also our two counries’ commitment to democratic ideals, religious freedom, and divestiy,” Carlson said. “I hope this display leads to deeper understanding and appreciation of wonderful influence India had on the United States. The more our two countries share in the practice of our ideals, the more we can work together to show the world our common commitment to engender tolerance toward all religions, allowing them to flourish with dignity and freedom,” she added.